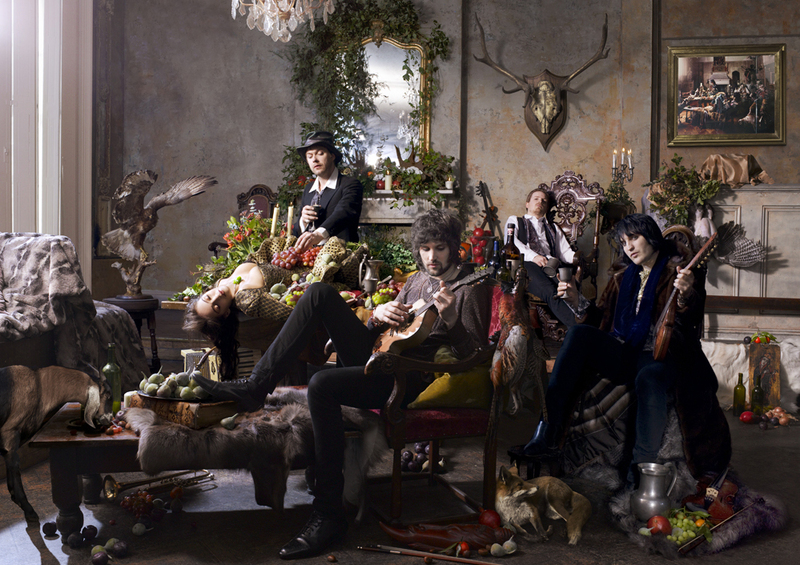 Kasabian and Noel Fielding Beggars Banquet Feast! ‘In aid of Teenage Cancer Trust, over 60 musicians have come together for a book that merges iconic portraits with captivating recipes, accompanied by personalised interviews. A concept created by Patrice De Villiers, with interviews by music journalist Andrew Harrison and recipes by rock ‘n roll cook Sarah Muir, the result is an impressive testament to what can be achieved by goodwill and earnest desire. The project has been supported by 250 companies and individuals all working together for the benefit of others. From rock legends to emerging artists, an incredible fusion of musicians reveal their passion for tucking into a favourite and often, unexpected culinary desire. Ifyou want to buy the book or the prints please click the link below’. Richard (complete with mandolin) and bassist Chris ‘Dibs’ Edwards is Bill Wyman. Stepping spookily into Brian’s shoes is their good friend Noel Fielding of The Mighty Boosh who—equally spookily—met Kasabian when they played on the same bill as the actual, real Rolling Stones at the Isle of Wight Festival. Noel had arrived by helicopter (‘the best thing I’ve ever done,’ he says), landing on the lawn of Kasabian’s hotel as the band were drinking Pimms. After bonding over a round of croquet they went to see the Stones, came back, stayed up all night and played croquet again the next day. ‘We weren’t quite as good at it the second time,’ Noel admits. For the sauce, in a small bowl, mix together the soy sauce and lime juice and chill in the fridge. Place the pheasant, mushrooms, garlic, ginger, oyster sauce and sesame oil in a food processor and pulse until smooth. Lay out two gyoza wrappers at a time and brush lightly with water. Spoon about 1 tsp of the pheasant mixture into the centre of each wrapper, being careful not to overfill. Fold the wrapper over into a half-moon shape and press the edges together to seal. immediately, with the ponzu dipping sauce. horizontally; do not cut the whole way through. Place the pork belly on a draining rack. Boil a kettle of water and carefully pour over the pork skin to scald it. Dry the pork with kitchen paper and place back on the board. Melt the butter in a small saucepan. Add the brown sugar and stir until dissolved, then add the onions. Cook gently until soft, about 5 minutes, then add the figs and black pudding. Cook until the mixture is soft and sticky, almost the consistency of marmalade. Remove from the heat and leave to cool. Heat the oil in a frying pan. When hot, sear the pork on all sides. Remove from the pan and place in a roasting tin. Open the pork belly along the slice made earlier and spoon the black pudding and fig stuffing evenly over the bottom half. Close together and secure with string. Brush the meat with some more oil and rub liberally with salt. Pour the cider into the bottom of the roasting dish. Roast on the middle shelf of the oven until the juices run clear, about 1 hour, basting the meat with the cooking juices. for about 15 minutes until the pork skin is puffed and crisp. Cut the meat into chunks rather then slices to serve. Melt the butter in a large saucepan and fry the bacon for a couple of minutes. Add the game bones and fry gently for 2 minutes. Stir in the celery, carrots, leeks and onion and cook until all the bones and vegetables are well browned. Stir in the stock, thyme, bay leaf, parsley stalks, peppercorns, cloves and seasoning. Simmer for 2 hours, skimming regularly to avoid the soup turning cloudy. Strain the soup into a pan. Strip any meat from the bones before discarding them and add the meat to the soup. Simmer for another 30 minutes.